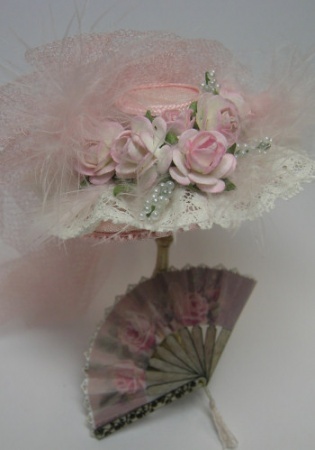 This project contains a lovely spring hat which uses pre-made paper flowers, but you can substitute ribbon roses if you like. The original kit included our laser cut fan kit, which is still available on our website, but I have included the fan artwork and pattern for the spine pieces in case you want to cut your own from cardstock. Download is in PDF format. It contains complete instructions with dozens of photos, full size pattern pieces for the hat, and fan.